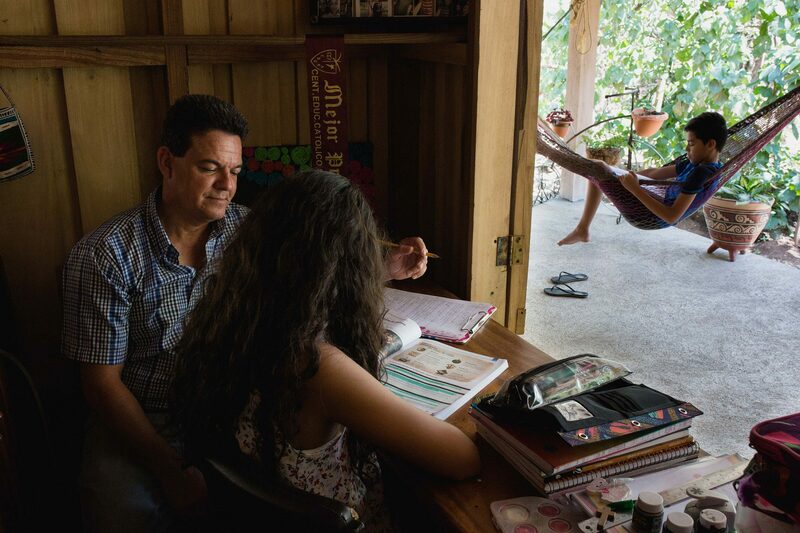 “I have never never demanded anything of them, just that the make their best effort and value the sacrifices that we make for them,” says Johnny while he helps Tania and Sebastian with high school homework. Photo by César Arroyo. Like every Thursday, Johnny Hernandez, 46, wakes up early to prepare breakfast for his children, Tania, 15, and Sebastian, 13. 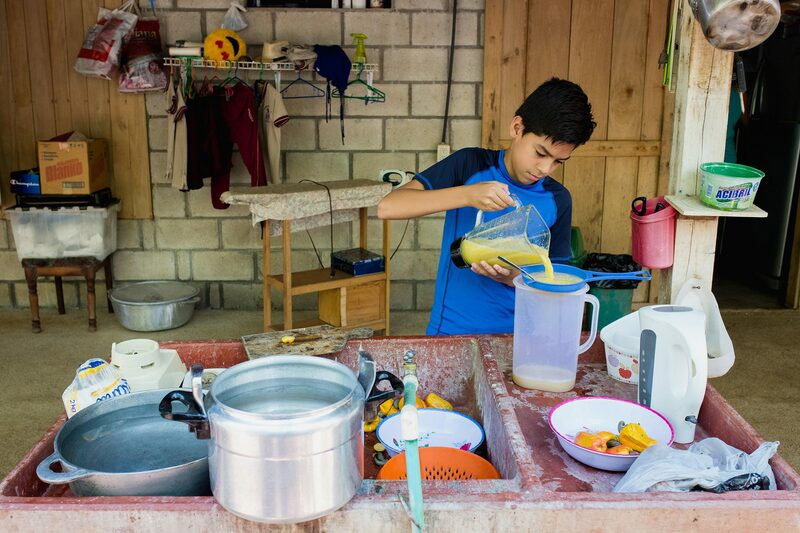 He takes them to classes in Nicoya and then takes them back home to Dulce Nombre de Curime to clean, wash, cook lunch, and if he has time or something to repair, works for a while in the car repair shop at their house. Johnny, 46, mixes household chores and sporadic work as a mechanic at the general repair shop in his house. Photo by César Arroyo. His wife Isela Martinez, 43, is the provider of the family. 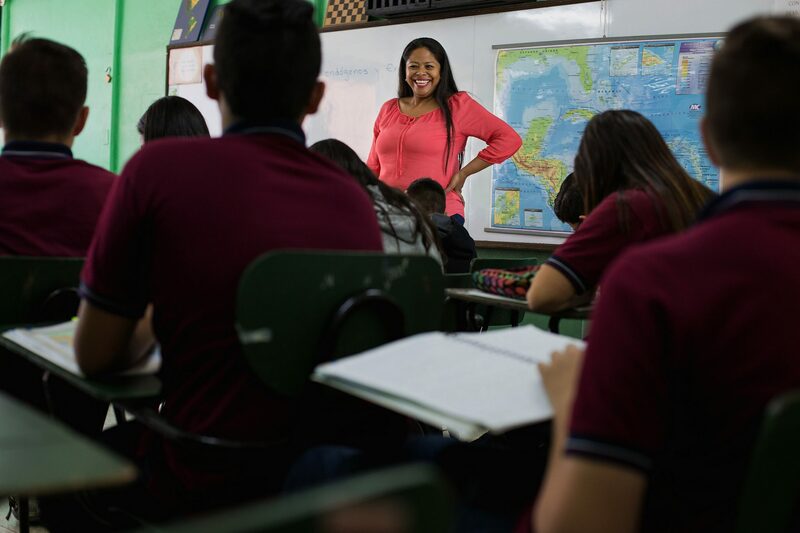 She leaves her house in Heredia at 5am to go to the high school where she works as a social studies teacher in the Vasquez de Coronado district in San Jose. “I come to Guanacaste at whatever time I have to,” says Isela, 43, who has been traveling to Nicoya for 10 years to be with her family on the weekends. Photo by César Arroyo. The family had to split apart when Tania was very young and suffered recurrent asthma attacks at least three times per week. Her doctor recommended that the best thing for her was to move to a warmer climate after Tania had 13 treatments in the same day. 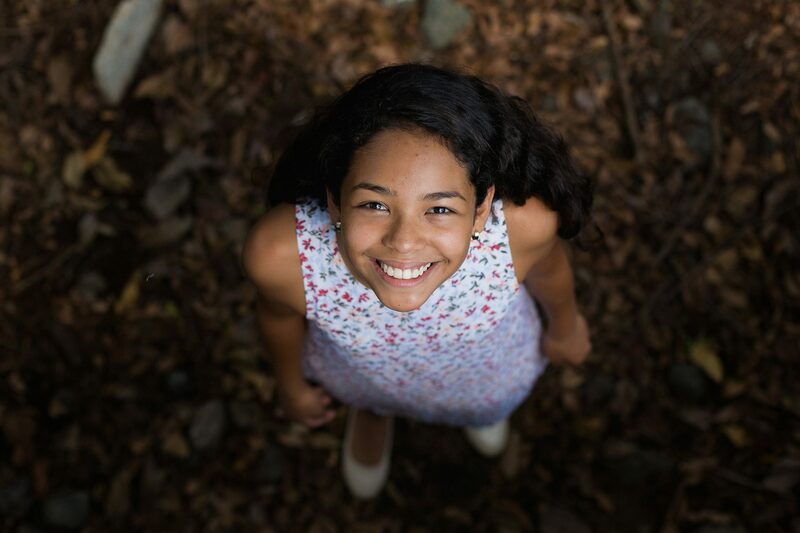 Tania hasn’t had an asthma attack like the ones she suffered as a child since arriving in the dry heat of Guanacaste. She’s at the top of her class and she wants to be a veterinarian when she’s big. Photo by César Arroyo. For the last 10 years, Johnny has taken care of them and of the household chores while Isela works in San Jose in order to cover the expenses. Every Thursday afternoon, she travels back to meet with her family at their farm house on the outskirts in Nicoya, surrounded by dry ranches with skinny livestock and long fields of cantaloupe and watermelon. While Johnny doesn’t have as much time as he’d like to work as a mechanic, he doesn’t get frustrated or feel less accomplished for taking care of household chores. Sebastian, 13, has the same tasks as Tania,15, at the house. They both know that these obligations take two and shouldn’t be the responsibility of just one person. Photo by César Arroyo. The specialist in gender equality and new masculinity Andres Valenciano, says that if boys and girls break away from traditional gender roles as children, once they are older it will be more natural for them to think more equally. “A man is classified by only one type of masculinity: an alpha male that doesn’t cry and can’t express his feelings.” Andres Valenciano, gender specialist. Johnny is the best example of that. “My mom always used to tell me: come and learn to iron because if you are walking around in a wrinkled shirt tomorrow it’s not the woman’s fault, it’s your fault,” Johnny says, laughing as he cooks rice with chicken. One day a neighbor called Johnny “lazy” for going to high school meetings and on a separate occasion they told him that his kids were going to “die of hunger”, but he doesn’t care what people say to him and takes it with the good humor that characterizes him. When Johnny, 46, doesn’t have cars in his shop, he works at a farm next to his house with livestock or he takes care of Duquesa, his horse. Photo by César Arroyo. Gender specialist Valenciano says that many men have doubts about how to exercise this new masculinity that differs from the traditional one, which is why it’s necessary to create spaces where they can express themselves and work on those fears. He adds that men also benefit from equality, not just women. 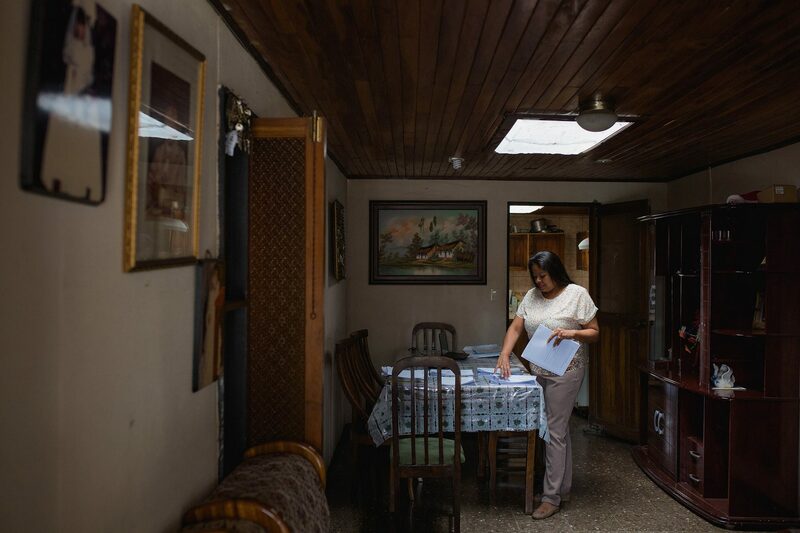 Isela Martinez, 43, reviews exams in her house in Mercedes, Heredia where she lives during the week. Photo by César Arroyo. Maybe that’s why Johnny feels just as satisfied as a man and as a father of the family with a wrench in his hand as with a broom. His only failure, according to Isela, is that he was never able to comb Tania’s hair.